Who is Huzoor Taajush Shariah? 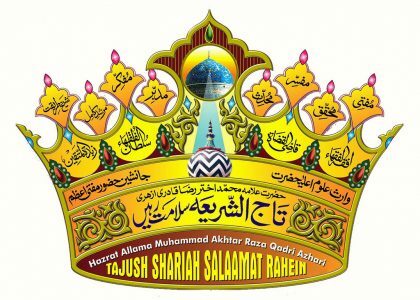 Welcome to our website which is devoted to the teachings of the Mujaddid of the 14th Century Hijri, AlaHazrat Imam Ahmad Raza Khan Qadri رضي الله عنه‎ and his successors until today, including Huzoor Taajush Shariah مد ظله العالي. Here you will find the pure teachings of the Ahlus Sunnah Wal Jamah free of the heresies rampant in our times such as Wahhabism, Salafism, Deobandism, Shiaism, Qadianism, Feminism, Perennialism etc. Not only will the pure Aqeedah of Ahlus Sunnah be found here but also the correct Fiqh, which many people are ignorant of or distort for their own purposes. InshaAllah you will be able to benefit much from this website, there will also be posts regarding Tasawwuf, as this way is that of the Qadri Silsilah originating from Ghawth al Adham Shaykh Abdul Qadir Jilani رضي الله عنه‎ .